Cape Cod Whale Watching Tours - You'll Have a Whale of a Time! Whales are some of the planet’s most amazing and beautiful creatures. Setting out on a Cape Cod whale watching cruise is your chance to get as close to one as you’re ever likely to get! 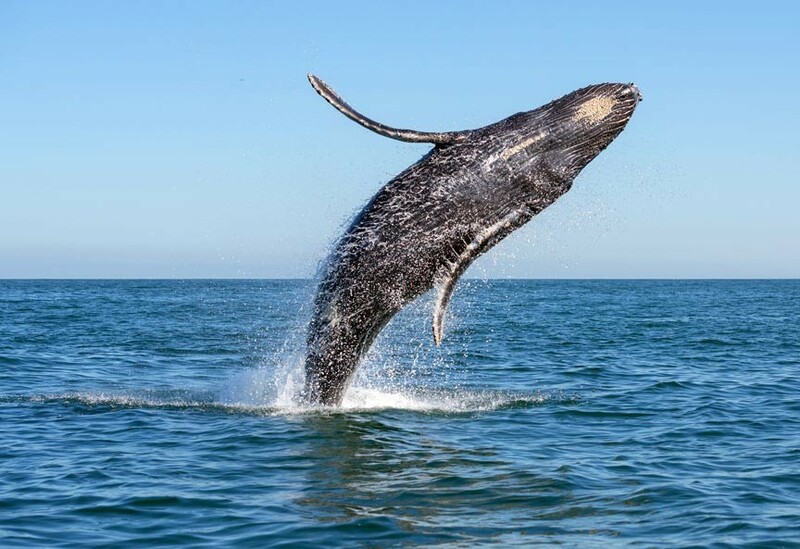 Many of the folks who visit our Falmouth B&B, The Captain’s Manor Inn, list a Cape Cod whale watching cruise as one of the top things they’d like to experience. If you love animals or the sea and have never been on a whale watching tour, you really should go. It’s hard to explain the feeling one gets when you find yourself near one of these wild and magnificent mammals. It’s a feeling of part joy, part excitement, and immeasurable amounts of pure awe. Luckily, there are plenty of options here for getting out on the water and having this amazing experience. The companies that offer these tours know when and where to go to find the whales. While they cannot guarantee a sighting, chances are excellent that you’ll see not just one whale but many! What kind of whales will you see? It all depends. The favorite, of course, are the humpback whales. Humpbacks often have curious newborn calves that will come up close to investigate the boat – so exciting! Other whales you might see on your cruise include finback, minke, pilot, and sei whales. It’s not just whales, though. The waters here provide a rich environment that supports a cornucopia of marine life. Cape Cod whale watching tours also routinely see dolphins, porpoise, blue and basking sharks, sunfish, blue fin tuna, and more. As I said above, there are many options in the area for whale watching tours. The three companies listed below offer 3 ½ to 4 hour, narrated daily trips. Each has their own style of touring but all offer excellent, safe, and responsible whale watching tours. The main factor in choosing is how long you want your day to be, how far you want to travel. If, for example, you wanted to make a day of it and see lots of Cape Cod, Dolphin Fleet in Provincetown is a great option. The scenic, two-hour drive will introduce you to much of Cape Cod and you can explore town before going on your excursion. Those with less time or inclination may prefer the shorter drive to Captain John’s in Plymouth or Hyannis Whale Watcher in Hyannis. No matter which you choose, we’re certain you’ll have an amazing experience that you’ll remember for years to come! Whatever it is you hope to do during your Cape Cod getaway, let us know. There’s nothing we here at The Captain’s Manor Inn like more than sharing our beautiful area with you. Plan your Cape Cod adventure today!